This last gameday with my LGG we had our second Escalation day. Our first escalation games were last month at 500 points, but that was 6th edition, so we opted for repeating this point level to keep it small for 7th edition. I'll give a brief overview of the list I was running and how the games went. For the 500 point level the only requirement was one Troop choice and no 2+saves, MC's, or vehicles with armour totaling 34+. Last month, I played a mixed list with Deathrain-D's, full firewarrior team, and one EMP Grenadier unit in a Devilfish. I did ok, winning one game and losing my second, but it just wasn't much fun sitting and waiting for my opponent to come to me. 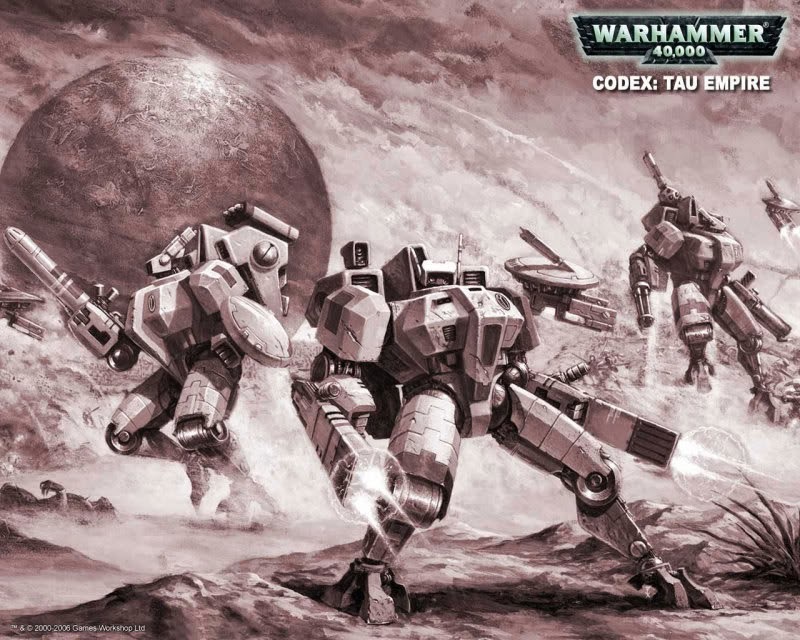 This month, I asked if it was ok if I switched to Farsight Enclaves instead of Tau Empire and everyone was fine with it. Escalation leagues are for learning new armies, so this was a good opportunity for me to learn about the FSE and how they play. My first game was against the Astra Militarum. He'd had bad games in the previous month, so he'd tweaked his list to have some more vehicles in it, instead of mass infantry. We were using the Maelstrom of War missions and we rolled mission #3 which has increasing amounts of objectives in your hand. He deployed first and opted to go first, no Night Fight. He put his Bullgryns in front of his Taurox to give it a cover save and put the Chimera on the other side of his deployment zone, to try and cover all fire lanes. I put my Stealth Suits in Outflank and deployed both crisis teams across from his Taurox/Bullgryns. Unfortunately for him, I seized the initiative and got to shoot first. The general gist of the game was that I destroyed his Taurox early and ran rings around his dismounted infantry. My Stealth team didn't come on until turn 4, but it didn't seem like I needed them much. Eventually, a lone Bullgryn made a 10" charge into combat with my suits and killed two of them over two turns of combat before the game ended. We didn't tally the final score, but I had about a dozen Tactical Objectives and he had 5 or 6. Plus I had Linebreaker and First Blood. Victory for my first game as FSE! Not bad, but I'd been pretty lucky with my early shooting. Game #2 was against the Grey Knight player that had trounced me in the last game (I failed every single leadership check and 2 of my 3 units fled off the table. sad). I wasn't sure how the game would go, but so far he hadn't lost a single league game. This game we rolled #3 for the mission, so escalating objective cards again. He deployed first and went first. Similar deployment to my previous game with his vehicles spread out to restrict my options. I deployed pretty much the same as well, with the Stealths Ouflanking and the crisis suits bunched together across from his Rhino/Chimera pair. I was a bit fortunate early on. I immobilized one Razorback despite a 3+ cover save (Forewarning + Sanctity) and his other one immobilized itself on some difficult terrain. I rolled pretty good for my armour saves and he didn't have many weapons that could penetrate my 3+ armour. Without his Razorbacks his infantry just couldn't catch my kiting suits, and the Stealths popping in the backfield further confused his advance. In the end he just couldn't get into combat with me, and he was getting the raw end of the Shooting deal every turn. I had bad luck early on with tactical objectives, but I scored 5 points in each of the last two turns for a pretty solid win, despite only having the Shas'vre from each squad and 2 stealth suits left. Victory for game #2! That went pretty well, but I again had some luck early on with keeping him immobile and running circles around him. My superior armour save rolling also proved to be a huge help, but I can't rely on that forever. The last game of the day was against a Space Wolves player. I'd never played Space Wolves before so I was pretty excited. We rolled mission #6 which is decreasing tactical objectives. A Draw! I was happy with the result because I'd eked out a draw despite missing out on most of my early tactical objectives and getting caught up in combat by his thunderwolf. The "All Suit List" did pretty well, but I was pretty lucky all around. A few unlucky rolls on the armour saves and I would have been in trouble. Every suit counts when you only have 11 models total and 5 of them are in reserve! Battlesuits are fantastic in Maelstrom missions. They are tough to remove, denying some tactical objectives to your opponent, and they are very zippy. With their thrust move they can move very quickly to get in range of those tactical objectives. I haven't used Fireknives since 5th edition, but I think that I may start to use them again; at least, I will for these smaller games. In 5th edition, Fireknives were a necessity because you couldn't take two of the same weapon, but their ability to target just about anything really helped me out in these tiny games where I only have a couple units to shoot with. Outflanking Stealth Suits are awesome, even without the Acute Senses that they used to have. I keep writing lists and taking them out, but they never ever let me down, so I put them back in. Love 'em. If you want to get a feel for how our tables were set up, here is a very short video that one of our members put together that shows some of our games going on. Stay tuned and I'll try to snap some actual photos of the games next time.